Proposed Changes In Organ Donation Stir Debate : Shots - Health News Donation after cardiac death involves removing organs minutes after life-support has been stopped for patients who still have at least some brain activity. Is that enough time to make sure a person won't recover? 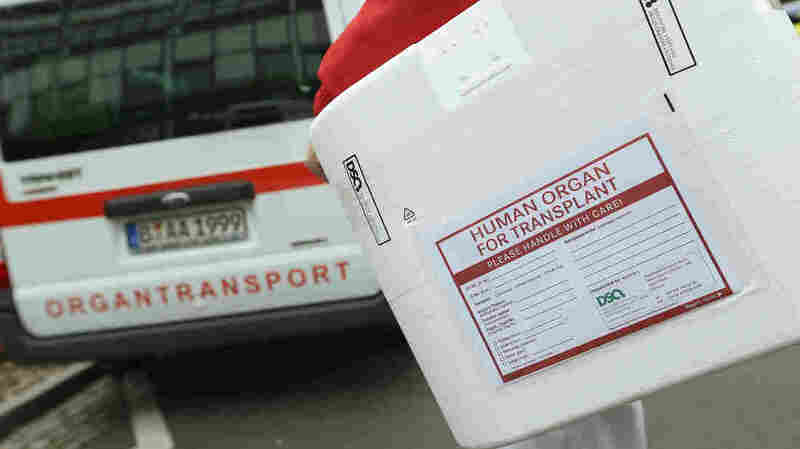 The nation's organ transplant network will consider a controversial proposal Monday to overhaul the guidelines for an increasingly common form of organ donation. The board of directors of the United Network for Organ Sharing will open a two-day meeting at the organization's headquarters in Richmond, Va., to consider new guidelines for donation after cardiac death. Donation after cardiac death involves removing organs minutes after life-support has been stopped for patients who still have at least some brain activity. The approach has long been controversial for a variety of reasons, including whether doctors wait long enough after life-support is stopped to know for sure whether all brain activity has ceased. Most organ donors now are brain dead. The new guidelines would change the official name of donation after cardiac death to "donation after circulatory death." They're generating debate over when the possibility of organ donation should be raised with patients or their families. The guidelines say local hospitals and organ procurement organizations should decide individually how to handle that question. "I'm worried about it," says Dr. Stuart Youngner, a bioethicist at Case Western Reserve University, noting that there's long been a clear line between the decision to discontinue care and to donate organs. "From the beginning the organ transplantation establishment has recognized that you must keep them separate," Youngner says. "You must keep the people who are taking care of and making decisions about the potential donor separate from those who are trying to get an organ to put it into the recipient." But the UNOS committee proposing the new guidelines says exactly how to handle that process is best decided on a case-by-case basis because local values vary, as do the circumstances of individual cases. "The best way we felt to handle the very delicate decisions about approaching families was to have the hospital and the organ procurement organization work together to decide in individual circumstances how best to approach a family," says the University of Pittsburgh's Christopher Hughes, a transplant surgeon and a committee member. In addition, when it comes to donations after cardiac death, decisions have to be made quickly. "The organs have a very short time period — measured in minutes — after the pronouncement of death for those organs to be removed to where they can still be transplanted," Hughes says. The proposal is raising concerns among advocates for the disabled. "Pressure could be brought to bear on people to give up on saving their lives and give away their organs," says Diane Coleman of the group Not Dead Yet, which seeks to protect rights of the disabled. And Stephen Mikochik, of Temple University's law school, worries about certain situations, such as when parents rush to the hospital and discover a child has suffered severe brain injuries in a car accident. "You're going to be extremely upset. And if a physician comes in and says, 'Look, the prognosis doesn't look very good.' And then a procurement officer comes in and says, 'Well, look, let's make something meaningful out of this.' You might decide right then to agree to take the person off life-support so some of the organs can be harvested," says Mikochik, who works with the National Catholic Partnership on Disability. "The problem is that it could well be that your child will, you know, regain some consciousness," he says. "There's just no telling at that point." For his part, Hughes says the proposal includes other changes aimed at protecting potential donors. Organ bank workers, for example, would be prohibited from getting directly involved in giving patients drugs to preserve their organs. "The idea of the potential for exploitation of a possible donor — we don't want that to even be a perception that that is the case," Hughes says. As if all that's not controversial enough, the board is also considering a proposal to revamp the rules for allocating kidneys. For more about that read this previous post.